Instagram is beginning a whole new revenue stream. Now the 130 million users who engage with product tags on Instagram’s shopping posts can buy those items without leaving the platform, thanks to reserved payment info. 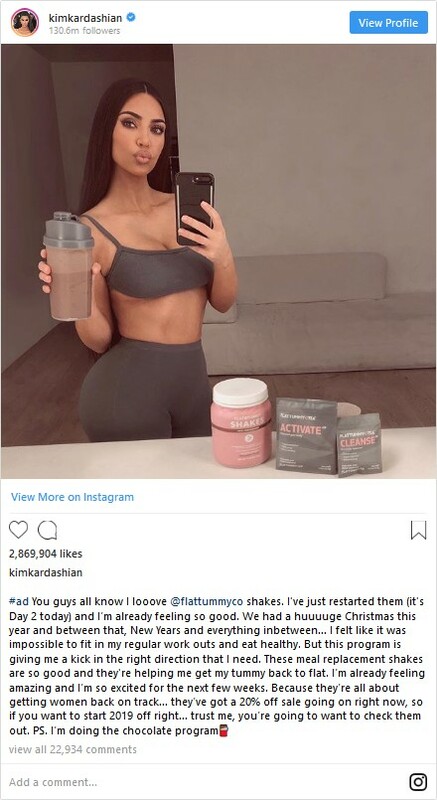 “Checkout with Instagram” rolled out today in the U.S. with more than 20 top brands, including Adidas, Warby Parker, and Kylie Cosmetics which will no longer need to direct people to their websites for purchasing. An Instagram spokesperson announced, “We will introduce a selling fee to help fund programs and products that help make checkout possible, as well as offset transaction-related expenses, We aren’t sharing the specific number right now. We are testing a selling fee with businesses during the closed beta. It will not change the price of the items for consumers.” That means Instagram wants retailers to cough up the fee in a switch for higher purchase conversion rates rather than pushing users to pay a convenience fee for purchasing through the app. Check out tags will display on feed posts, Stories and Explore page from the brands in the limited beta that Instagram plans to ultimately open to more companies. When people tap the posts to reveal product tags and initiate one, they’ll see a Checkout with an Instagram button instead of the old “View on Website” button. Checkout on Instagram is currently in exclusive beta for brands and accessible to users in the US. The brands below will start rolling out today and over the next weeks — and more will be coming soon! The Queen Posts on Instagram for the First Time! The queen has posted on Instagram for the first time, about a new summer exhibition at the science museum in London. 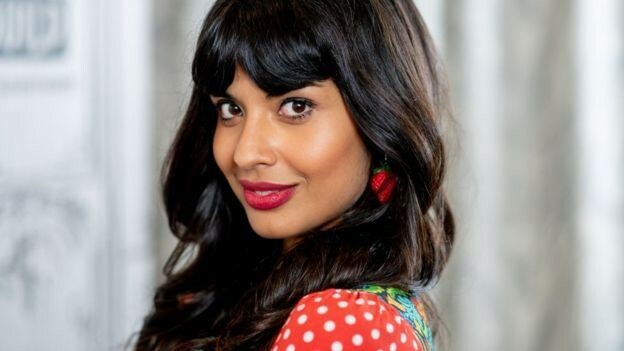 Her new foray into social media world started five years after her first post on Twitter. 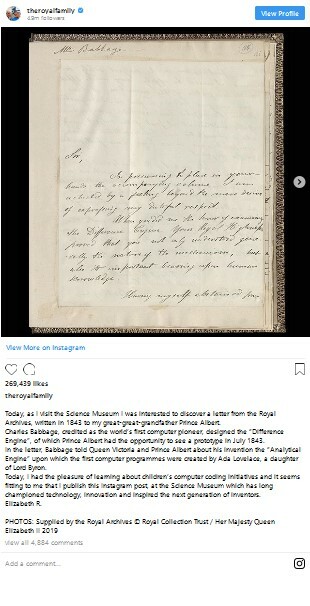 Her post, which has already gained more than 32k likes on Instagram, was a picture of a letter written in 1843 to her great-great-grandfather Prince Albert by Charles Babbage, the Victorian computer engineer. “In the letter, Babbage told Queen Victoria and Prince Albert about his invention the ‘Analytical Engine’ upon which the first computer programs were created by Ada Lovelace, a daughter of Lord Byron,” text following the post stated. The new exhibition, which initiates on 10 July, will show the story of Alan Turing and the company at Bletchley Park who broke the Enigma code during the World War II, helping the Allies break Nazi Germany. “It is always a pleasure to welcome Her Majesty to the Science Museum, and I am delighted that HM The Queen has taken the opportunity to post on Instagram for the first time and announce Top Secret. our fantastic new exhibition” stated Sir Ian Blatchford, manager of the Science Museum Group. The Queen will be expecting her first Instagram post not to receive the same specific reaction to her first Twitter post prompted. 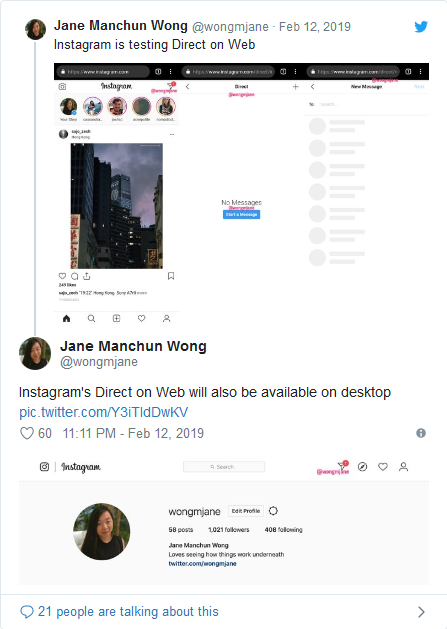 Instagram is testing its DM (direct message) for the web on mobile and desktop, according to app researcher who shared a screenshot of the feature on Twitter. Currently, the desktop version of Instagram is a minimal, pared-down tale of the mobile app that displays little more than the feed. There’s still no straight way to upload pictures, and the service is always delayed to add new features. Browser notification was added only last September. Some features, such as uploading stories, are restrained to the mobile app only. 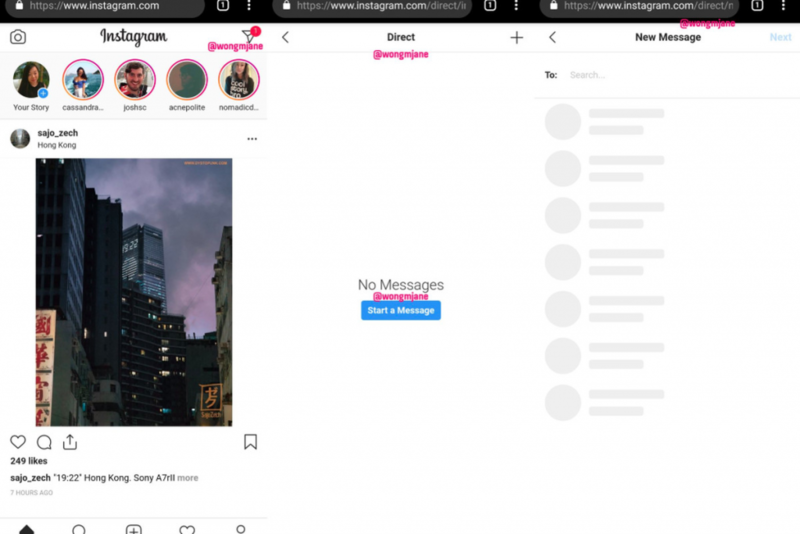 Instagram said it has “no plans to let users upload photos or stories from the desktop.” DMs coming to the web would be a big step ahead for the previously mobile-only app. There are many reasons why this change to the web could be happening now. Instagram has established a standalone messaging app called Direct, which it started testing in 6 countries in 2017, and the transit to the desktop could be a hint that messaging has become more to the Instagram team. The move could also have something to do with Facebook’s plans to merge Messenger, Instagram DMs, and WhatsApp, into a single, united platform. For now, an Instagram spokesperson told The Verge that the feature isn’t being publicly tested. How to Use the New Instagram Question Sticker for your Business? Using the new Instagram stories question sticker is an excellent way to spend more time engaging with your audience. You can use them to craft creative stories for your account. Social media has become one of the most important parts of our lives these days. We brought most of our daily life to social media and somehow got addicted to them. However, social media has its goods, and we can take advantage of it for doing a lot of daily works like finding out about news and our friend’s breakfast! Buying and selling online, communication seems so much easier now. It takes time, often months, sometimes years to build good followership real interested Instagram followers who engage with your content and brand. And sometimes even with the right contents and continuous effort you still would not be able to create bigger followership due to your lack of knowledge and exposure, and then you may need help with an Instagram specialist.